My poor mom had some dental work done this week and has been feeling under the weather. So in an effort to get her back in tip-top shape, or at least eating again, I created this soup for her. It’s a quick soup, but tastes great: creamy and comforting, just what you need when you’re not feeling your best. In a large cast iron pot, heat olive oil over medium-high heat. Add onions and sautee for a few minutes until tender. Add garlic, sweet potatoes and butternut squash, and sautee for an additional 2 minutes, season with salt. Add vegetable broth and thyme. Cover and cook for about 20-30 minutes, or until potatoes and squash are fork tender. Remove thyme stems from the pot. 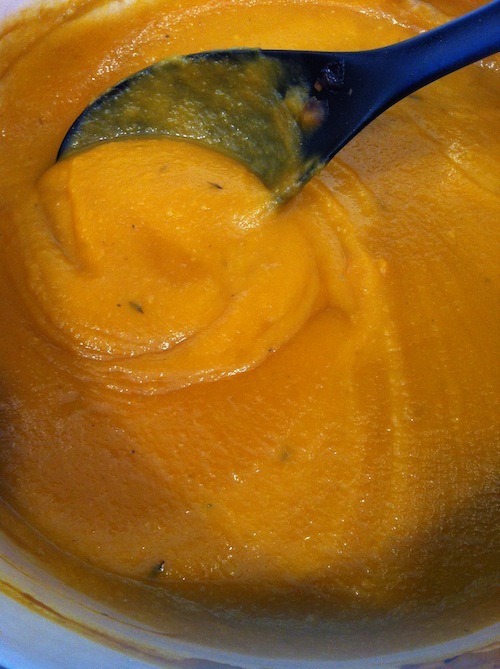 Turn heat off and using an immersion blender, blend the soup until smooth. Serve immediately.